Bottle size 32 fluid ounces. 32 fluid ounces. 32 fluid ounces. 1 gallon 32 fluid ounces. 16 fluid ounces. 2.6 ounces. 1 gallon. 2.6 ounces. 2.6 ounces. Quantity 1. 1. 1. 1. 1. 1. 6. 1. 6. 6. How to Select the Best Chainsaw Oil? The fastest way to ruin your chainsaw is by using oil not fit for purpose. Many people can make the mistake of purchasing oil that doesn’t suit their particular machine purely because it says it’s for chainsaws. In this buying guide we will show you top rated products available online that do the job required. We also aim to educate you on the right oils for the right job, at competitive prices. When you’re choosing the right type of oil for your machine, the work type is not an overly important aspect. However, if you’re a professional who spends hours every day using a chainsaw, you will need a lot of oil. It pays to establish how much oil your chainsaw uses so you always have enough with you. When you are using chainsaw oil – whether it’s engine oil or bar and chain oil – you should avoid getting it on your skin. Wear gloves and if contact is made with your skin or eyes, wash it immediately. Don’t get complacent when dealing with engine fluids. They can contain toxic chemicals that react upon contact with skin. Bar, chain and engine oil allow your chainsaw to work efficiently. The bar and chain oil, generally contained within an automatic oiler, is released onto the chain to enable it to stay lubricated and to reduce friction. Engine oil keeps your chainsaw running efficiently. Always remember to keep your engine oil and bar and chain oil levels topped up. Without either of the two your chainsaw may break down. 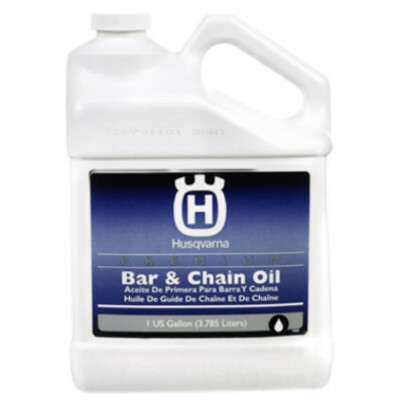 Bar and chain oil is usually a thicker consistency than engine oil, as it’s designed to adhere to the chain easily. It’s hydrotreated heavy naphthenic petroleum oil and it’s only suitable for use as a bar and chain oil due to its consistency. Standard chainsaw engine oil is developed for use by a range of chainsaws. It enhances engine power, reduces friction, provides faster cutting time and even prevents wear or scuffing of chain links and the bar. It’s even designed to prevent build up of sap or tree gum. The easiest way to get the best bang for your buck is to purchase your chainsaw oil in bulk. Many different manufacturers and brands offer larger containers, or packets of 2 or 6 bottles. The more you buy, the cheaper the unit rate, in theory. However, in saying that, you should always try to buy the brand recommended by your chainsaw’s manufacturer. They know what works best with your particular model. Even if it’s more expensive it could save you money in the long run. Bar and chain oil, offered by many chainsaw manufacturers, is all about making your chainsaw run much more efficiently. It’s a lot thicker than standard engine oil and sticks to your bar and chain. It works by lubricating your bar and chain for reduced friction all the while making the cut a whole lot easier than it would be without it. It makes it easier to cut through wood. It keeps your chain and bar lubricated. For chainsaws that require a lot of maintenance it’s another thing to have to remember. All chainsaws are fitted with a reservoir that’s designed for holding bar and chain oil. In many cases this bar and chain reservoir is serviced by a self-oiling system. This allows the bar and chain to automatically be lubricated throughout the chainsaw’s use. Just remember to keep it topped up! It’s generally easy to tell the difference between bar and chain oil, and engine oil. Bar and engine oil is far thicker to enable it to stick to the bar and chain. It’s hydrotreated heavy naphthenic petroleum oil and should not be substituted for other kinds of oils. It keeps your engine running smoothly. Many brands offer it for both injection and premix systems. It lubricates engine components while it’s running. Most offer easy-to-remember mix ratios such as 50:1. It can be difficult getting the right gas to oil mix. It can be difficult making sure it gets to all parts of the engine. 2-cycle engine oil is used in 2-stroke chainsaw engines. It’s the most common form of oil for chainsaws and is one of the most beneficial. 2-stroke engine oil features components that help to lubricate moving parts of the engine while it’s running. It forms a thin film between pistons and the cylinder wall which stop the engine from breaking. It also features good lubrication properties which lubricate the rod bearings, crankshaft bearings and piston pins. It increases the maximum engine power. It provides faster cutting time. It protects against corrosion and rust. It prevents scuffing and wear of chain links. It can’t be used with pole electric chainsaws. It’s not suitable for all kinds of chainsaws. It has quite a high price tag for just one bottle of oil. 1 quart of bar and chain oil. Bottle size: 32 fluid ounces. QIs this SAE No. 30 weight oil? ANo it’s thicker as it’s bar and chain oil. Engine oil is not recommended for bar and chain lubrication. QCan this oil be used on electric chainsaws? AYes, but not all. Check the operator’s manual. QWhat weather is this oil suitable for use in? Even though this bar and chain oil is an expensive product, it does what it says. It gives you more engine power, reduces friction and even protects components on your saw from getting rusty. It’s a suitable bar and oil product for many chainsaws, especially those produced by Oregon. Check out what other people who purchased this product think about it. 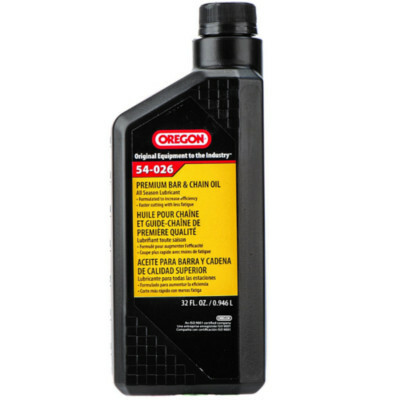 Read Oregon 54-026 chainsaw bar and chain oil reviews. It can stop your chain from jamming or jumping off the bar. Chainsaws seem to use far more of it than some other brands of bar and chain oil. It doesn’t seem to have as much ‘tack’ in its consistency as some other brands. QIs it regular or synthetic bar and chain oil? QDoes the oil have dye to indicate when it’s running low? For the price, this chain oil does what it says it does. It oils the bars and chains of compatible chainsaws well and helps prevent rust too. The only negative would be that many users note they tend to use more of this than other brands. It’s hard to know whether that’s down to the individual’s auto-oiler or not but it may be a note worth paying attention to. Overall it does represent good value for money, therefore it’s one of the best chainsaw oils for the money. Check out what other people who purchased this product think about it. 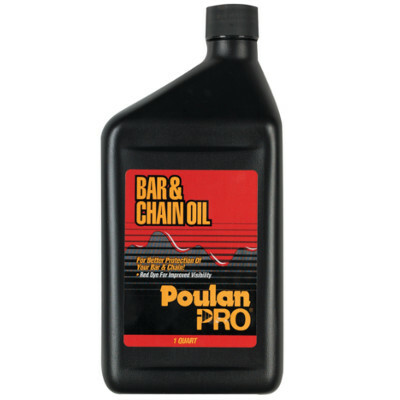 Read Poulan Pro chainsaw bar and chain oil reviews. It’s not just for bars and chains, but for sprockets as well. It prolongs bar and chain life. It’s one of the most affordable bar and chain oils on the market. It’s only recommended for use with Sun Joe chainsaws and pole chain saws. It’s hard to pour out of the bottle without dripping it everywhere. 1 quart bar and chain oil. QEven though it specifies it’s for use with Sun Joe chainsaws, can it be used for other gas powered saws? AYes, but not all. Check your operator’s manual. QCan it be in warm and cold conditions? AYes, it’s for all seasons. QWhich Sun Joe models is it suitable for? AiON8PS, iON16CS, SWJ698E, SWJ699E, SWJ700E, SWJ701E, SWJ800E, SWJ802E, SWJ803E, SWJ805E, SWJ806E and SWJ807E. 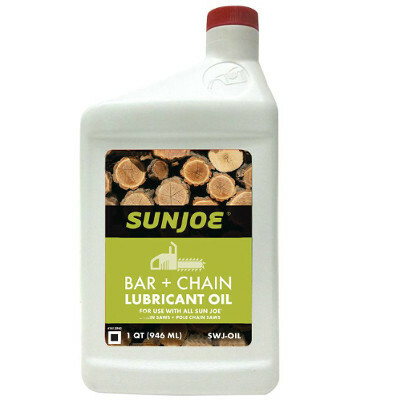 This Sun Joe bar and chain oil is easily one of the best bar and chain oils on the market. Not only does it offer vital protection for your chainsaw’s bar and chain, but it’s also one of the most affordable. It’s recommended for use in Sun Joe products but many users note its effectiveness in other manufacturer’s products such as Husqvarna. Check out what other people who purchased this product think about it. Read Sun Joe SWJ chainsaw bar and chain oil reviews. It contains base stocks and tackifier additives which help to reduce high speed chain throw-off. It extends the lifespan of bars, chains and sprockets. It helps reduce heat and friction. It’s very well engineered oil. It has a high viscosity level. You would expect to get more oil for less money for buying in larger quantities but this product is very expensive. The bottle is not convenient to pour with. 1 gallon of bar and chain oil. QIs this oil suitable for use in warm and cold conditions? AYes it’s for all seasons. QIs it petroleum or vegetable-based? QCan it be used for other chainsaw brands? AYes, but refer to your operator’s manual. This Husqvarna bar and chain oil is very well engineered for use on a range of Husqvarna chainsaws. It offers high viscosity and all the benefits you would expect to keep your chain and bar running as it should. However, when you buy in larger quantities you expect to pay less per ounce. This Husqvarna chainsaw lubricant doesn’t represent good buying. It’s more expensive per ounce than most other brands. In saying that, if you’re the owner of a Husqvarna chainsaw it does pay to stick with Husqvarna fluids. Check out what other people who purchased this product think about it. Read Husqvarna chainsaw bar and chain oil reviews. It reduces bar, chain and sprocket wear. It reduces heat and friction which allows you to cut a lot more efficiently. It can be used year-round. It’s for sale for more money per ounce than most other brands. It’s recommended for use only in Makita gas and electric powered chainsaws. QCan it be used in all weathers? QWhat chainsaws are recommended to use this oil? AMakita gas and electric powered chainsaws. For a product that’s only recommended for one brand of chainsaw, it has a very large price tag. Makita may be pricing themselves out of the market for accessories if they aren’t able to offer oil that’s the same cost per ounce as other brands. Other than the pricing, it does help keep Makita chainsaws running smoothly regardless of the season. It’s not top rated but it’s effective for what it’s intended for. Check out what other people who purchased this product think about it. 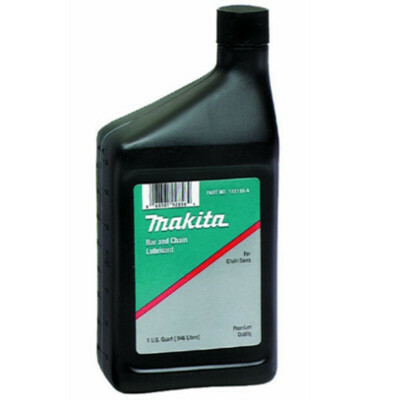 Read Makita 181119-A chainsaw bar and chain oil reviews. The fuel stabilizer doesn’t leave residue which can foul plugs. It’s suitable for up to 50:1 mix ratios. The bottle shape and size is convenient for pouring and mixing. It’s quite expensive per ounce. The bottle shape, though convenient, can prove difficult for some people to measure and pour with. 16 ounces of 2-cycle engine oil. Bottle size: 16 fluid ounces. QWhat is it recommended for? AToro, Lawn Boy, Ryan and other 2-cycle power equipment. QWhat size is the measuring cup? QWhat shelf life does engine oil have? AIf stored properly, up to 15 years. Briggs & Stratton has used clever marketing strategies to provide a product that looks different than others, but operates in the same way. Although there’s no doubt that it’s a premium product, it has a very big price tag for a product that, aside from its uniquely shaped bottle, is much the same as any other. Even though you do pay for quality and it’s best to not take risks on unknown products, it does appear that in this case, you are paying for a name. For this reason it’s not the best chainsaw oil for the money. Check out what other people who purchased this product think about it. 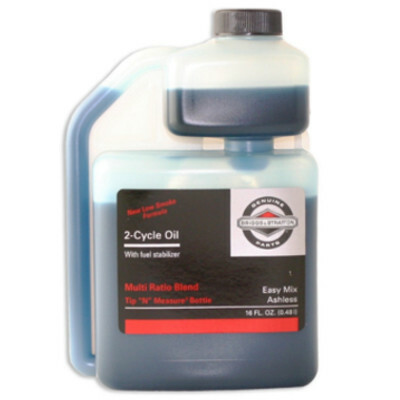 Read Briggs & Stratton chainsaw 2-cycle engine oil reviews. It lowers the operating temperature of the engine. It helps to extend the engine’s life. It includes a fuel stabilizer. It’s a hardy, premium product that’s perfect for professionals. The bottles are a little small for most users. Bigger bottles and less of them means less plastic going into landfill. It’s quite expensive to purchase. 6 bottles of 2-cycle engine oil (2.6 oz). QWhat is this product’s shelf life? AWhen stored properly, up to 15 years. QWho is this product targeted to? AProfessional outdoor power equipment users. QDoes this oil offer the professional formula or the previous smokeless kind? There’s a reason why this Husqvarna oil is so popular online – it’s worth its weight in gold. It’s a quality product that many chainsaw users of various brands will continue to buy. It’s well engineered and engines of all kinds just love it. Its only downside is the price. It is quite expensive to buy, especially since these little bottles are only 2.6 ounces each. Overall though, it’s a top rated product that pleases many consumers. Check out what other people who purchased this product think about it. 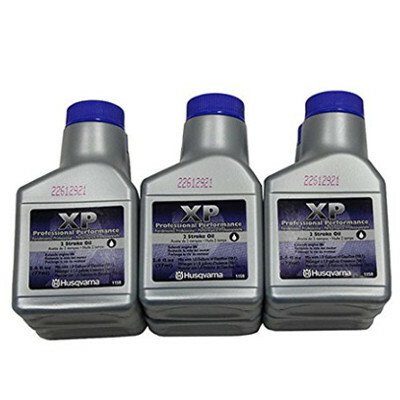 Read Husqvarna XP chainsaw 2-cycle engine oil reviews. It doesn’t produce smoke when it burns. It mixes well with gasoline in all weathers and temperatures. It can be used in air-cooled engines. It offers increased performance and fuel economy. The construction of the bottle is poor as many users note the lid allows leakages. It seems to run better on larger outdoor equipment such as snow machines and rotaries rather than chainsaws. 1 gallon of 2-cycle engine oil. QIs it suitable for oil-injection or pre-mix? QDoes the bottle have measurement lines on it? QIs this oil synthetic or not? For the price, Lucas is a very good semi-synthetic engine oil. It doesn’t produce smoke when it burns and it can even be used in air-cooled engines. It’s for use in all weather and offers better fuel economy as well. In comparison to other brands it seems to maintain engines on a range of outdoor power equipment just as well. Check out what other people who purchased this product think about it. 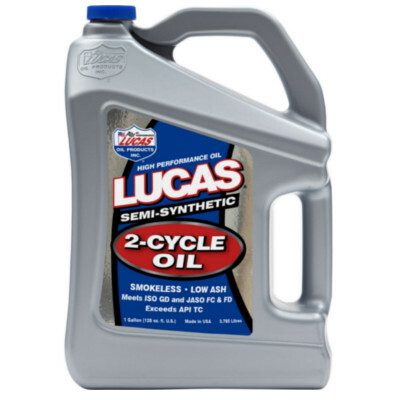 Read Lucas chainsaw 2-cycle engine oil reviews. It protects the engine against rusting, corrosion and general wear. The bottle size is perfect for a 50:1 ratio mix. It offers good engine performance. It’s very expensive to purchase online and many users note they received the best deal in a physical store. For the price it doesn’t offer any special technology advancements. QHow do you mix the 50:1 ratio? AMix one 2.6 ounce bottle of Echo engine oil with one gallon of gas. QHow many bottles come in the pack? QDoes it contain fuel stabilizers? Although ECHO branded 2-cycle engine oil is good quality oil for a range of chainsaws and other outdoor power equipment, it’s one of the most expensive engine oils on the market. It offers reduced smoke, increased performance and general engine protection, but it’s not affordable for all users. In comparison to other brands of oil it’s not top rated. Check out what other people who purchased this product think about it. 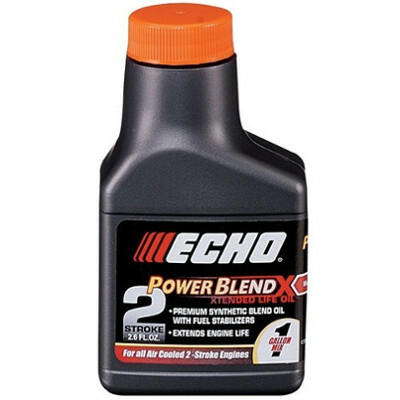 Read ECHO chainsaw 2-cycle engine oil reviews. In comparison to other brands its lubricating qualities are far more superior. It’s a premium synthetic oil that’s also bio-degradable. It suits a wide range of high performance chainsaws. It cleans engines as well as protecting them. It’s not affordable for all chainsaw users – especially those who go through a lot of chainsaw oil. QIs it suitable for use in warm or cold weather? QIs it synthetic or regular? Even though this STIHL oil is one of the most expensive oils per ounce on the market, it’s certainly one of the best. It features some of the best oil technology available which translates into engine efficiency. It’s also a fully biodegradable synthetic oil with engine cleaning properties. Whether you have a STIHL power tool or not, you will most likely benefit from using this oil. It’s well worth the price tag and reviews reflect this. Check out what other people who purchased this product think about it. 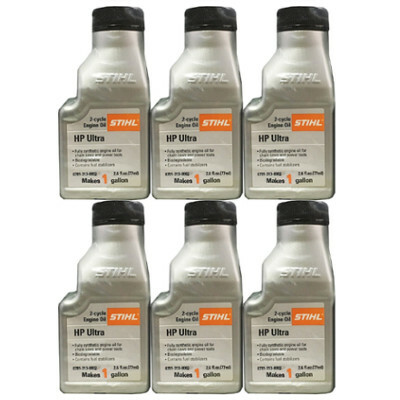 Read STIHL chainsaw 2-cycle engine oil reviews. Where to Buy Chainsaw Oil? Chainsaw oil can be purchased both online on websites such as Amazon, and in stores. Whenever you buy a chainsaw you can normally get the best deal on engine oil and bar and chain oil as part of the package. Bulk deals are usually better online as well.